The Art Collector had the opportunity to meet with renowned Bahraini artist Abbas Almosawi who, under the guidance of ARTDIVANO, was exhibting at ArtBaB 2017. Which work is best representative of your style and why? 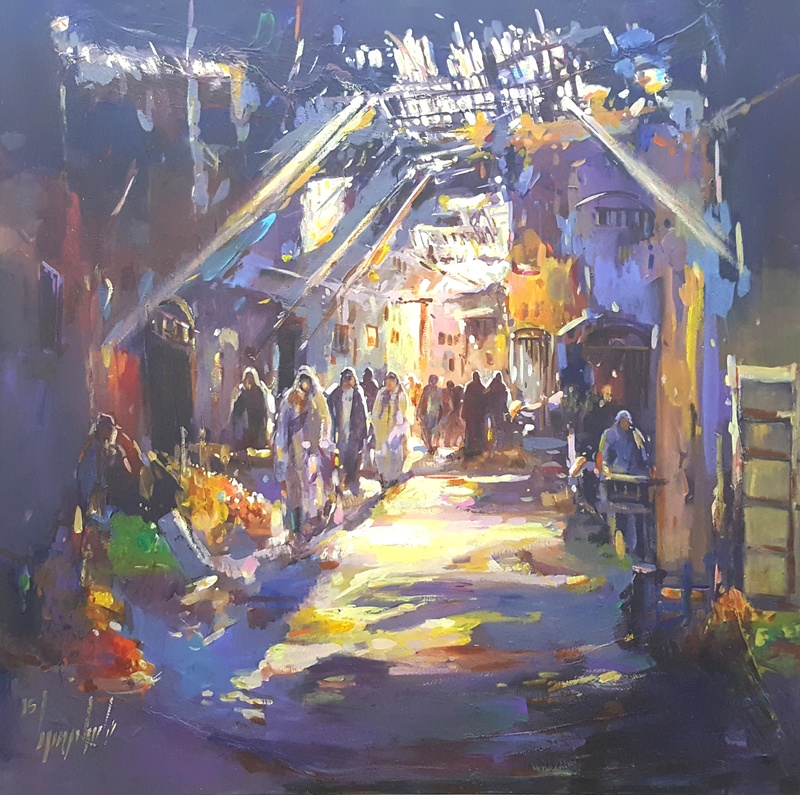 The landscapes of my country in expressionism style and the traditional oriental souq scenes in semi abstract style are best representative of my works, which are inspired by my childhood life in my birth country Bahrain where I still live nowadays. I grew up in nature as I used to swim in the natural springs which were scattered around Bahrain and do not exist anymore. Fishing was part of our daily life and as the seashore was very close to our neighborhood I was encouraged as a small child to go fishing especially in the afternoons and during school summer holiday. The Dows and Seascapes in my works are paying witness to this lost time. The house of my father was located on Muharraq, one of the islands of Bahrain as an archipelago, where the Pearl Merchants had their quarters and where the Pearls from Bahrain took their journey into the World. 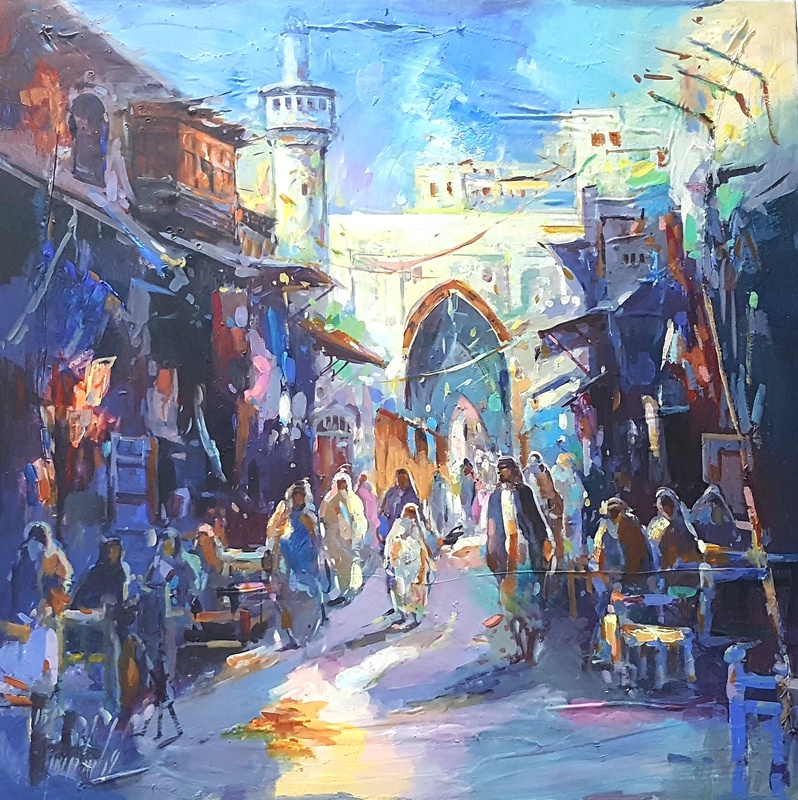 I am still mesmerized by this world of the past, and my works depict the tradition of the oriental souq and the Bahrain sea life and characteristic landscaping in all its facets, atmospheres and styles – and will continue to do so. Art expresses the human being, Art makes the Human being human. Art always has to be seen in context of history, heritage, traditions and the role of the artist in the society he/she has been born into and might have chosen to live in. Art is an expression of the soul of the artist and so it is with mine. My art represents the artists’ emotions: a feeling deep in their hearts which comes to the surface on canvas in color and other media. It serves as a reminder to people about environmental, social and economic issues past, present and in the future. We are nothing without our past and to make it worth living in this world for our children and grand children we have to take care of our planet in peace and in an environmental friendly way of life. Given the irreversible changes of urban and suburban rural landscapes, my art provides the viewer a vital bridge to the past. Your works use an abstract style yet still retain representational form. Does abstract art need to keep visual references or can form be autonomous? Do visual references enhance the work in your opinion? I do believe that abstraction in art is today’s leading art style and stands for the contemporary awareness and consciousness, which searches for vocabulary and diverse and universe ways of expression and impression. Abstract art is not in need of visual reference as such, appearing on the canvas apart from the visual blueprint in the artists’ mind. Form can and shall stand autonomous and visual references in my opinion do not enhance the artwork at all. What enhances artworks is its meaning and the intension of the building process. My art simply expresses a style which I developed in my 40 years of being a professional artist as my signature style. I have combined and merged the abstract, semi abstract and realistic elements on canvas and used a diverse range of colors, different techniques and creative styles. 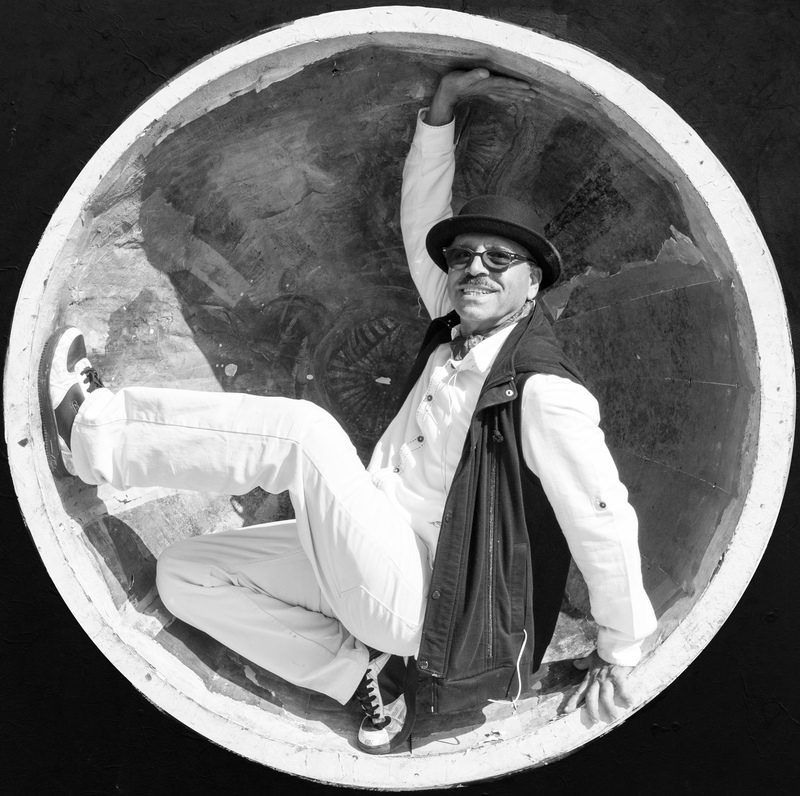 What are the obstacles that Bahraini artists face in the (global) contemporary art market? I strongly feel that the Bahrain art scene has developed over the past century and that we need the exposure to develop further. Galleries such as my gallery in Bahrain, ARTDIVANO, who are establishing an online gallery and running an artsy gallery space are representing artist from Bahrain and the GCC are doing a great part of the works to showcase middle eastern art with a global exposure. But as far as I am concerned the biggest obstacle for the art scene in Bahrain is that artists here are very reluctant in staying loyal to a gallery which is representing them and working within a long-term fruitful relationship. The galleries have the patience to wait for the development of their careers, including a growing exposure and recognition growing naturally in a process of constructively developing yourself and within your gallery. Do you consider Bahraini contemporary art to indulge tradition or is there a distinct transition to a new narrative? I consider the Bahraini contemporary art indulges with tradition and there is no distinct transition to a new narrative. However….young emerging artists are trying to develop a new style of their own with taking more influence by international trends and fully take their tradition and heritage to abstraction. The “Peace Project 2000” has been a universal and humanitarian UN project to raise awareness for the protection and preservation of our planet “Earth” through the arts involving photography, music, poetry and creative athletic movements. I have made extraordinary experiences standing shoulder to shoulder with children all together for a project dedicated towards helping to bring up, enlighten and educate the future generations about the dangers we create by ourselves which contribute towards the distortion of this beautiful our earth planet every day. These include the cutting of trees in forests, polluting the sea and poisoning the air, plus all the problems awaiting humanity as a result of this waste. Art is a universal language which can be read and understood by all human beings. Art objects are in all their facets are telling us as much as hundreds and thousands of words and feelings and create emotions, and all this coming through a child is fully truthful in its expression of emotions for its instinctive, genuine and straight forward thoughts and feelings. 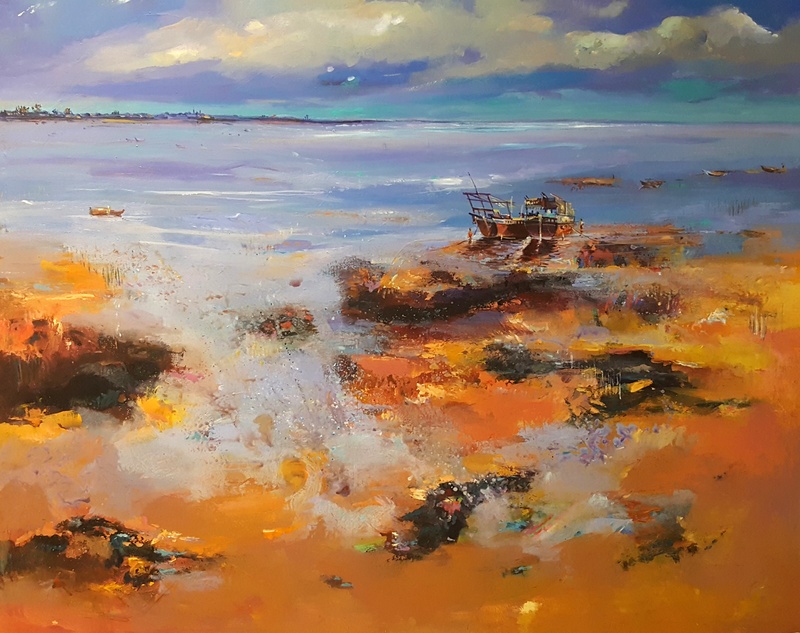 Abbas Almosawi is represented by ARTDIVANO, a Bahrain-based gallery and boutique that holds frequent exhibitions in members’ clubs, private villas and holds regular art salon-type evenings. Written by: admin on April 10, 2017.